Hello! I feel like it has been ages since I've last posted and I'm so thrilled to be able to show you a peek at a new Taylored Expressions set called Friendship Blooms!! 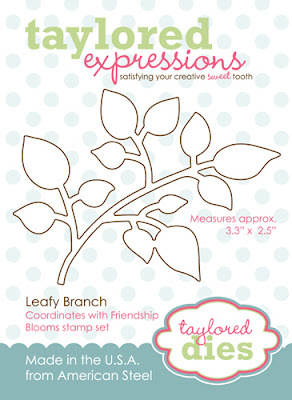 This beautiful set of 22 stamps is deeply etched on cling mount rubber and is full of gorgeous images and sentiments. 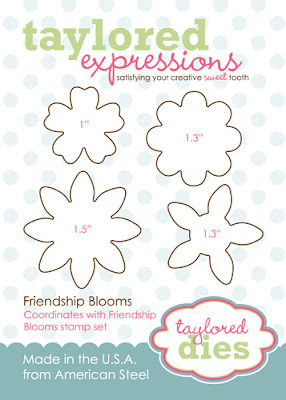 The set also has 2 coordinating Taylored Die sets - Friendship Blooms & Leafy Branch - which make cutting out those flowers a cinch! 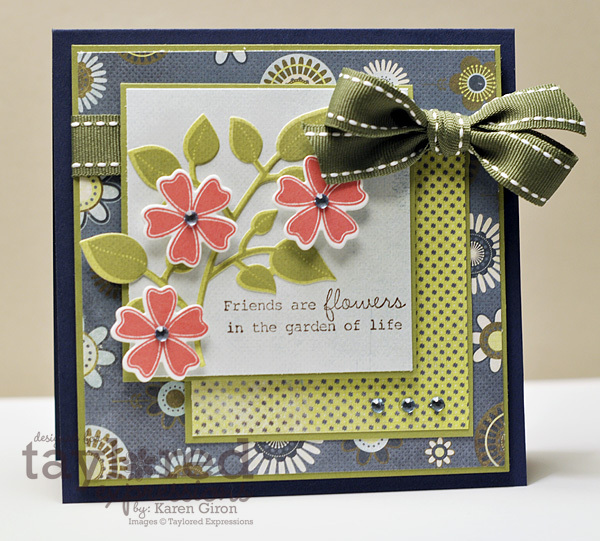 I used a fun little 6x6 paper pack from Basic Grey called Marjolaine and offset the blues and greens with a pop of Warm Red for the flowers, which were cut out using one of the Friendship Blooms Die flowers. I added a few Ice Blue rhinestones and some olive stitched ribbon along the top. 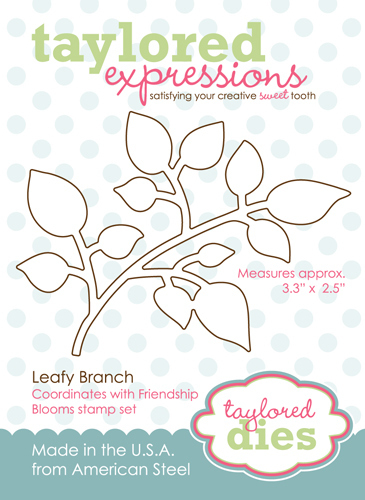 The Leafy Branch die was used to cut out the branch image, which I stamped in Olive Pastel. The layout is Mercy's MTSC102. Love your card, Karen! The flowers are fabulous with that DP. My wallet is in big trouble with this flower and die set LOL! Oh my WORD Karen! This is OUT of this world!! GORGEOUS colors and patterned paper and I LOVE the layout and the flowers!!! Absolutely beautiful! I love how the pink flowers stand out! LOVE the pop of red!! GOR-JUS!!! Just gorgeous! I LOVE how you placed the flower along the branch! Beautiful!